Here in southern California, we don't get snow. Or close to snow. We get rain during the winter...but no snow. Drive up a few hours, you get your snow- but not here at like as sea level as one can get. SO although I would have LOVED to make a desktop calendar featuring something with snow...I seriously lack in that picture department. I hope this desktop calendar featuring the word snow will suffice. Happy December sweet friends. WAIT. I just remembered an album filled with pictures of snow. Shoot. I'm in the mid-west! last week it snowed and yesterday is was 74! 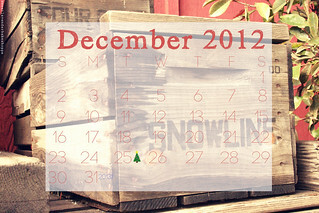 we never know if it will snow for christmas ;) ? I sure hope it does though! Oh my gosh! That's crazy. I felt like it was kind of like that here a few weeks back. SUPER cold for a day or two and then HOT the very next day. Hope it does snow for you as well!